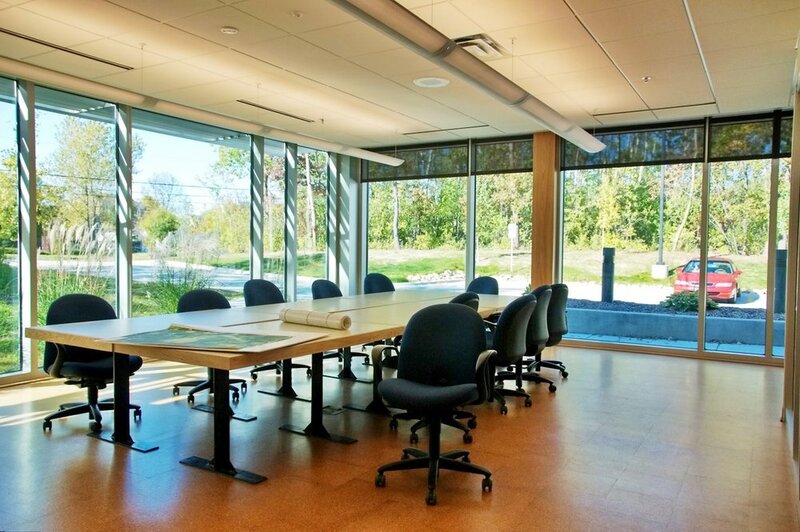 Mahtomedi Public Works Facility — OERTEL ARCHITECTS, LTD. This new facility for the City of Mahtomedi consists of approximately 4,000 sq. ft. of vehicle maintenance space, 16,500 sq. ft. of vehicle storage space, 1,700 sq. ft. of shop space and 7000 square feet of general office, locker rooms, storage and multipurpose space. Many green building features are incorporated into this facility. The surrounding old growth forest on site has been largely preserved, the existing building onsite will be reused for cold storage, pervious pavements will be used, low-e insulated glass, “living wall” green screen features that will help control cooling costs in the summer, a storm water retention system and daylighting features are incorporated with the use of Solatube skylights.